Though she’s the IT girl of social media, trendsetter and no stranger to shocking the public with some controversial moves, Kylie Jenner clearly has a heart of gold as well. The KUWTK star has donated $150,000 to American kids’ organisation Smile Train, which will help more than 600 kids with cleft lip and palates receive brand new smiles – aww! More: ‘F*cking traitor!’ Kris Jenner RAGES at Kim Kardashian – over Caitlyn Jenner! 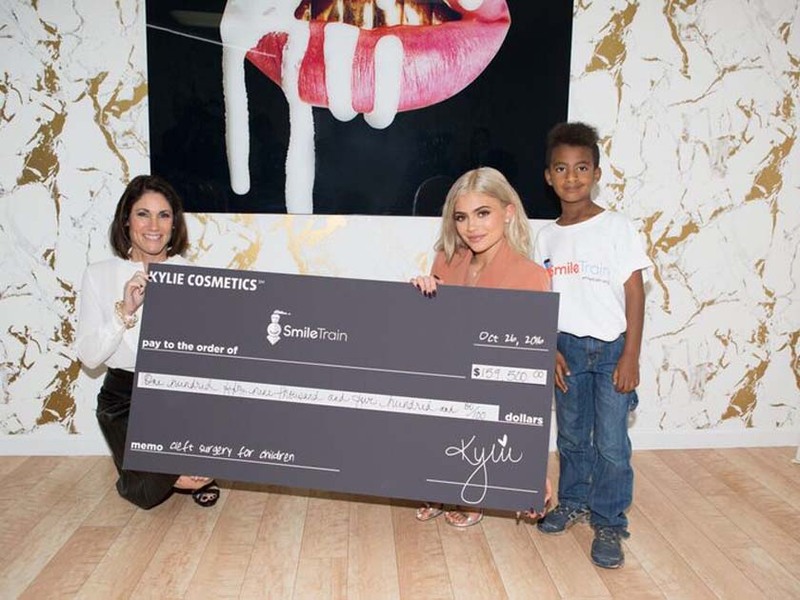 The Lip Kit maven presented the cheque, equivalent to around £123,000, to Smile Train CEO Susannah Schaefer at her LA headquarters on Wednesday (26th October) – and it’ll pay for 638 children to receive new smiles. ‘Through my company Kylie Cosmetics, I was able to create a beautiful pink lip kit shade called Smile specifically for Smile Train. Posing with six-year-old Zachary, who received free surgery through a partner hospital in his home country of Ethiopia, Kylie also spoke about how ‘honoured’ she felt to be a part of Smile Train. Now, isn’t that an uplifting story for everyone?